What's in a Name? : Where'd the name '7-Up Come From? 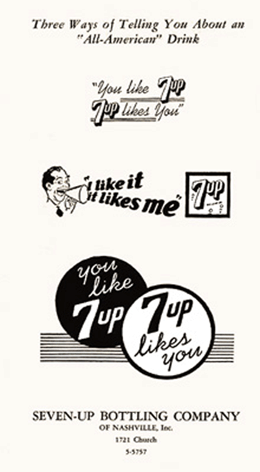 Urban Legend #1: Charles Grigg saw a cattle brand that looked like '7Up' and adopted it for his new soda. Urban Legend #2: Grigg was playing dice or poker and had his 'aha!' moment. Other Trivia: Grigg promoted his new drink as a sure cure for the common hangover and marketed it as such. 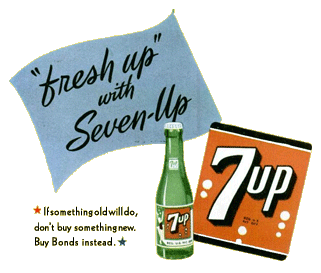 Ironically enough, 7-Up eventually became as popular as a hard drink mixer as it was as a simple soft drink. Urban Myths also abound alleging that Charles Grigg was born and lived as an albino. There is no proof whatsoever substantiating this elaborate claim. You Can Help to Keep Us Going. Missouri native Charles Leiper Grigg was born in 1868 in Price's Branch. By the time he was 22 he'd already opened a small general store. Restless for more, he decided to move to St. Louis, MO to work at an advertising firm. In the course of his new career, he gained exposure to the highly competitive carbonated beverage industry. 1919 found Charles Grigg becoming a top sales rep Vess Jones, a local manufacturing entrepreneur. With Jones' backing Grigg invented and marketed 'Whistle', an orange drink. Whistle soon became the Jones' biggest seller and Jones promoted Charles Grigg to Sales and Marketing manager. Grigg couldn't work well under Jones, and left both Jones' company and Grigg's pet project, Whistle. Grigg's next career stop was the Warner-Jenkinson Co. of St. Louis, a developer of soft drink flavoring agents. Grigg invented a new carbonated orange drink with 14% sugar content he named Howdy. Grigg found financing in the form of one Edmund G. Ridgway and together with local Attorney Frank Gladney, they formed The Howdy Company. Solid financing, coupled with Grigg's own orange soda "Howdy" combined to ensure rapid growth, adding new bottlers eager to bottle and distribute Howdy. Howdy's main competition from the get-go was Orange Crush, a formidable target. Grigg initiated a nation-wide campaign rather spuriously asserting that any orange-flavored beverage should contain a minimum percentage of orange pulp or orange juice, Crush had long marketed their offering as the only true orange flavor, but The Howdy Company claimed that Howdy was produced with concentrate based on the essential oils of orange peel, and thus, they did not make "orange juice". 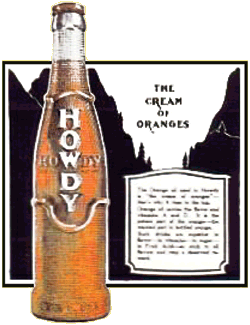 Naturally, Charles Grigg maintained that Howdy was the "purest, finest orange flavored soft drink in America", and while by 1926 Howdy had indeed acquired over 400 franchised bottlers, Orange Crush continued to dominate the market. Howdy was clearly struggling for market share. Grigg and company determined to formulate an entirely new soft drink so as to broaden their market share. Quite wisely, they decided against a cola, rootbeer or ginger ale, hoping to find a new taste and flavor that would truly differentiate them in an already highly competitive soft drink industry. Any number of contemporary bottlers had already developed some form of lemon or lime flavored soft drink but there was nothing that was genuinely distinctive about any of the existing offerings. Howdy Company developed several trial extracts of a new , lithia-based lemon and lime flavor, and by the late 1920s had sent them to several of Howdy's franchised bottlers for market testing. Their reaction was uniformly encouraging and The Howdy Company debuted it's newest product, "Bib-Label Lithiated Lemon-Lime Sodas" in October 1929 (the 'bib' referred to the practice of labeling bottled goods with paper 'bibs', which made for both economy and efficiency in using the same bottles over a line of various products). Note the date; this was barely two weeks into the great stock market crash resulted in The Great Depression. As always, timing is everything, and Grigg's timing couldn't have been worse. Well perhaps one thing was, indeed, worse--the name. It stunk for any number of obvious reasons. Grigg's 'aha!' moment wasn't much better: they changed the name to "7Up Lithiated Lemon-lime". Another stinker. Grigg then had his 'Crush' moment. They shortened the name to simply '7Up'. Short, sweet, and simple. Though there remain several urban myths that revolved around Grigg's inspriation for the name '7Up', none have ever been substantiated. I've highlighted some of them in the sidebar to the left. 'Lithiated' drinks were libations that contained lithium citrate, a mild anti-depressant. Coca-Cola had it's cocaine and 7-Up and other lithiated waters and sodas had quite the similar effect, albeit somewhat less health threatening and less mania inducing. I'm sure that alternating between the two as either mixers or as chasers made for quite an interesting night on the town. Certainly just what the doctor ordered in the post-stock market crash years. Grigg and company went to elaborate lengths to tout the medicinal benefits of their lithium-laced concoction. "A glorified drink in bottles only. Seven natural flavours blended into a savoury, flavoury drink with a real wallop". Charles Grigg's lithium laced clear soda bested an estimated 600 competing, similar citrus flavored sodas to become a market leader by 1936. Such was the success of the product that Howdy Company changed it's name to The Seven Up Company in 1936. Just as the successes of Coca-Cola, Orange Crush, Hires Root Beer and Dr Pepper could be traced to nationwide distribution, Seven Up's commanding success in their niche was directly attributable to a 25-year, highly aggressive, creative national advertising campaign. This accomplishment shouldn't be discounted. 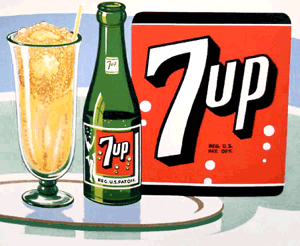 Remember that there were no 'big-box' supermarket chains when 7Up was trying to get off the ground. The midwest, as with most of America was a collection of Mom & Pop stores to negotiate with on a one to one basis from town to city to town, as Howdy Company's sales reps fanned out across the Midwest, and then West and East to create more distribution outlets for 7-Up. The Great Depression was clearly a hinderance, but may also have been very helpful in negotiating with individual outlets. Charles Grigg wasn't above marketing his product to the vast network of underground speakeasies during the Prohibition Years. Just as seltzer water and dry ginger ale, 7-Up was also becoming a very popular mixer. Indeed, once prohibition was repealed, Grigg started promoting 7-Up as a mixer. By the end of the 1930's, Mr. Grigg had made 7-Up one of America's most popular sodas. 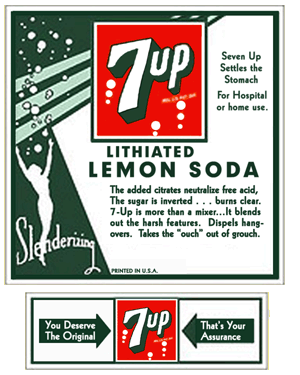 As for the lithium, Seven Up maintained lithium citrate in 7-Up's formulation until 1950. Mutual's 'Fresh Up' Show for 7-Up ran for a year from April 1945 to June 1946. It was a 30-minute comedy/variety show starring Bert Wheeler through December 1945, then Bert Lahr for the remainder of the run. 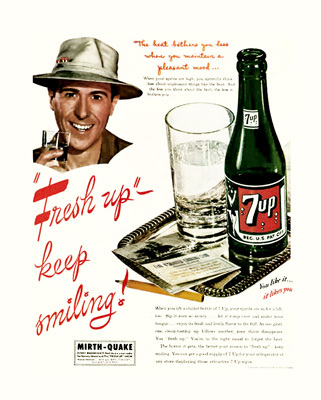 Promoted as a 'MIRTH-QUAKE' in all of Seven Up's print advertising, prospective listeners were cautioned to 'nail down' their radios in preparation for tuning in each Wednesday. 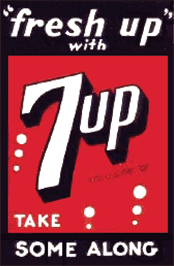 As with The Stock Market Crash and The Great Depression, World War II also helped 7-Up extend it's popularity even further. In addition, most soft drink companies struggled to survive throughout the war since sugar rations dramatically reduced the volume they could produce. Seven-Up required significantly less sugar for their soft drink than other companies, giving them a marked advantage during both the World War II years, as well as the three years immediately following, as their competitors ramped back up after the War. Mindful of their previous market timing issues, Seven-Up wisely employed their new-found profits to dramatically reinvigorate their national advertising campaigns. Their past advertising campaigns were directed to local communities. 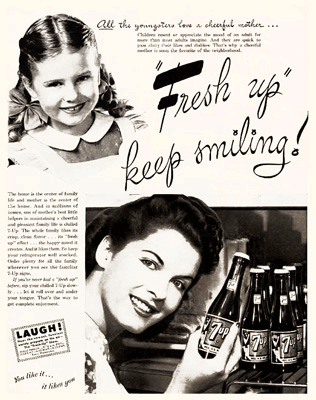 Seven-Up now began advertising in national magazines such as Life, The Saturday Evening Post, and Collier's. Well after the end of the World War II, Seven-Up was the third most popular soft drink in America. Cadbury Schweppes acquired 7-Up in 1995, 9 years after Dr Pepper and 7-Up merged. 7-Up remains the third most popular soft drink in Cadbury Schweppes soft drink lineup. ADDENDUM: Dr Pepper Snapple Group was established in 2008 following the spinoff of Cadbury Schweppes Americas Beverages (CSAB) from Cadbury Schweppes plc. 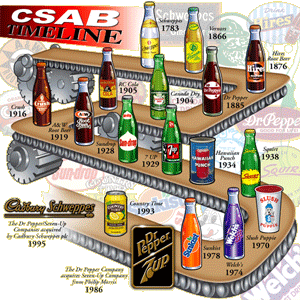 CSAB had formed in 2003 by bringing together Cadbury Schweppes; four North American beverages businesses, Dr Pepper/Seven Up Inc., Snapple Beverage Group, Motts LLP, and Bebidas Mexico. It's happening everywhere, folks. The corporatization of America and the corporatization of the world. Note that there's more of their brands' Soda History on our three pages of Soda Tributes than on the whole new Corporate Website altogether. Kinda shows how proud Corporate America is of it's history, doesn't it. 2010 ADDENDUM: Still no 7-Up history pages from the manufacturers of America's fourth oldest soft drink.